On Wednesday 17th we'll be running from Burton Overy (LE8 9DL). Routes (all on road): 6.4 miles, 5.5 miles and 4.2 miles. Alison also will lead a run for the improvers. We also offer 'structured' sessions on a Tuesday at Victoria Park (War Memorial, 7pm) where our coach supervises hill and interval training. These sessions are aimed at any member who wants to improve their running (irrespective of current speed). For 16/4/19 Sam will be in charge (session TBC). Roadhoogs were saddened to hear of the untimely death of Mark Chamberlain. 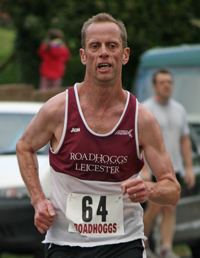 Mark was a member of the club for over 20 years and was our most successful athlete; winning several local races, the LRRL Summer League twice and multiple other prizes. He was also voted Roadhoggs Athlete of the Year a record six times. Full obituary to follow. Some really great running today; lots of PBs, despite the rather strong headwind in the final 2 miles. Final results. We hope everyone had a good race. Draft results are now available. Thank you to the members and friends who helped to stage the race. Our 10 week beginner has finished. Our improver group (Wednesday's 7pm at the same venue as the main run, above), aimed at at returning runners and people who've run their first 5K and want to move their running on, is still open. If you think this might be for you, please contact Alison (Beginner Running Coordinator). The infamous 'Bosworth Bog' channelled its inner Imelda Marcos and claimed a few shoes but by and large there was far less mud than usual. Those Roadhoggs hardy enough to brave a rather damp morning enjoyed a nice varied course followed by an even nicer varied selection of Trudy's baking; cherry and almond cake, lime and coconut cake or chocolate and marshmallow cookies anyone? Sam continued his great form and Gummi was looking more like his usual self. Trudy led from the front and the rest of our ladies packed well, showing some good determination at the finish. Caption this; in contrast to some of the bigger clubs, Roadhoggs accommodation at the Midlands XC Champs was at the modest end of the scale! Team manager and championship specialist Brian was joined by Richard and Dave for what proved to be a really good afternoon's racing. Thanks to Stephen Lee for the picture.